Serving a simple, fresh sauce with grilled meat is a great way to add flavor without adding too many extra calories. Preheat grill on Setting #4. Combine parsley, cranberries, lemon juice and zest, garlic and 1/2 tsp of the salt in a food processor; pulse until finely chopped but not puréed. With the motor running, slowly add 1/4 cup of the olive oil until completely incorporated. Stir in green tomatoes; set aside. Season lamb chops all over with remaining oil, salt and pepper. Grill, covered, for 4 or 5 minutes per side for medium-rare or until desired level of doneness. Serve with salsa verde on the side. 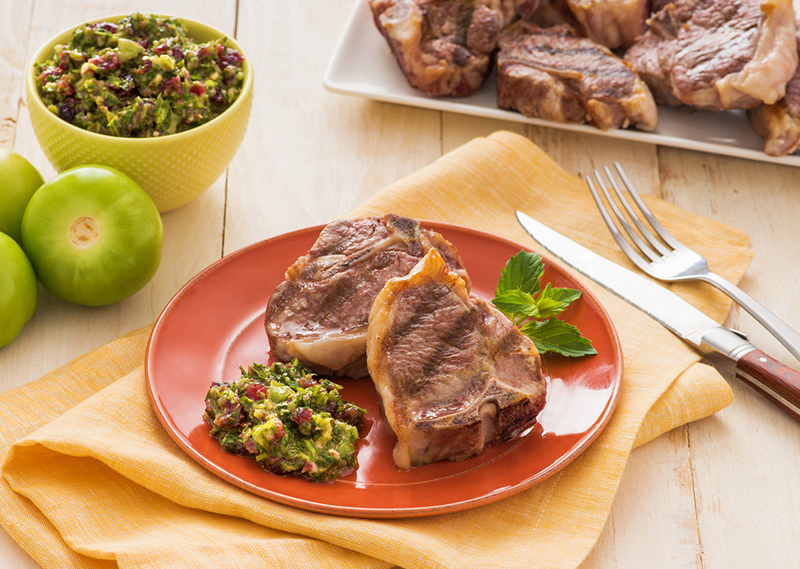 Tip: Salsa verde can be made up to 3 days in advance, then covered tightly and stored in the refrigerator.